Ace your Excel interview and assessment test. Don't walk into your interview unprepared. Get the job or your money back. You're applying for a job, and you're going to be tested on Excel skills. Maybe your interviewer will ask you a few questions about how you've used spreadsheets in the past. Or maybe you've been asked to take a full-fledged Excel exam before continuing in the application process. Either way, you're nervous, and want to be sure that you're ready for whatever your interviewers throw your way. Worried that formulas or functions you don't know about will come up during your interview? Feeling a lack of confidence about passing an Excel exam? Wondering whether you're truly qualified for the job? Eager to do everything you can to give yourself a leg up in the interview process? Don’t worry — you’re not alone. Around the world, thousands of employees just like you are applying for new jobs — and worried about the exact same things. How much more comfortable would you feel if you knew you had the skills it took to get the job? You would walk into your interview with confidence. You would be secure in the knowledge that your Excel skills are up to snuff. You would be proud of your abilities and project conviction during your interview. And, most importantly — you would blow your interviewer away by demonstrating that you're the most qualified candidate for the job. You’re a independent, productive person, and you like solving problems on the fly — so you’ve searched online for Excel interview and test prep materials. You’ve read forums and articles trying to figure out which formulas and functions will help you out the most, but there’s so much information out there that it’s hard to figure out where to begin. 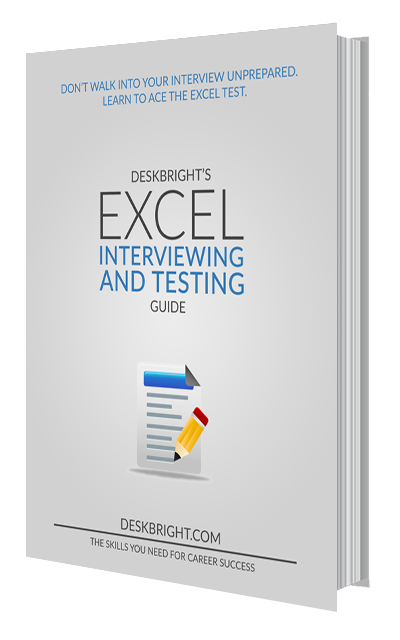 The Excel Interviewing and Testing Guide will teach you the skills you need to get the job. Written for the intermediate Excel user who wants to prepare for job interviews and tests, this book will outline the formulas, functions, and features you need to know as you apply. When you’re finished reading, you’ll feel confident in your ability to tackle any spreadsheet task that’s thrown your way. Here’s the best part: the downloadable .pdf now only costs $7.95. That’s an incredible deal considering how massive an impact this could have on your career. You'll get the job. Or your money back. If you don't get the job, you'll get your money back. Download the guide, read through it, and use it to prepare for your interview. On the rare chance that you don't get the job, send me an e-mail within 30 days of your purchase and I will refund 100% of the cost — no questions asked. You don't have to return anything — just let me know and I'll issue a refund. It's literally that easy. If you don't get the job, you keep the guide and get your money back. With zero risk on your end, you can't afford to pass up this amazing opportunity to ace your interview. Think about it: dominate the interview, and this book has already paid for itself a hundred times over. Plus, it comes with my guarantee — get the job or your money back. Download it today to get your competitive edge. Detailed walkthroughs of the most critical Excel features and functions to know (see below). All payments on my site are secured with SSL and PCI-compliant payment processing.